Amy Marshall: Growing, growing, gone for now! We recently sat down with Amy Marshall, owner of Strands of Sunshine which is a handmade jewelry and locally made gift store, discuss her experience with ActionCOACH Tampa Bay. Business and Life Before Coaching…. 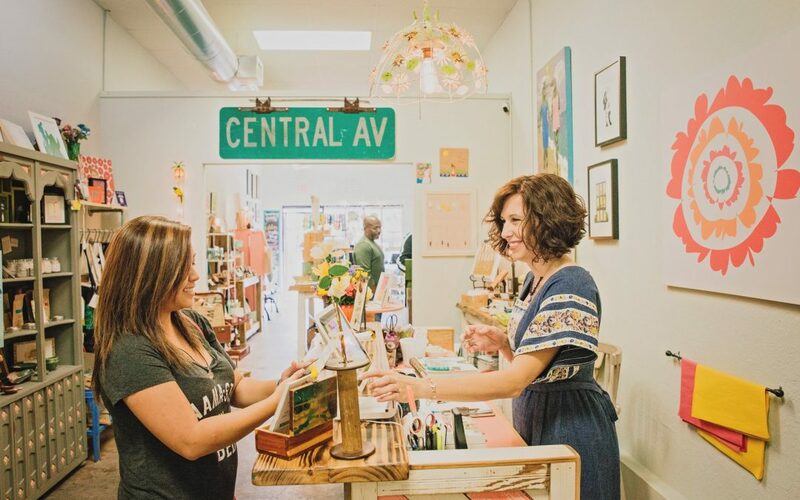 When Amy started coaching, she had just moved her store into a space on Central Avenue with triple the space and an equally triple-sized rent. She knew that with the extra financial responsibility, she wanted to have an extra level of financial understanding because as she put it “that was always the most intimidating part to me of business ownership”. In the beginning years of the business, Amy had “stayed away from [the financials] because [she] didn’t know where to start”. Amy had only hired one person before starting coaching which meant she had to work in the store every weekend. This was also an important challenge she wanted to tackle because her husband, Chad, was working in Georgia from Monday to Friday at the time. Amy knew she wanted to hire employees but she “wasn’t’ sure where to start” and she also “didn’t have any written policies of any kind or an employee handbook at that point”. Amy was doing a bunch of community events without always collecting contact information and she wasn’t tracking the amount of people coming into her store on a daily basis. She was paying for marketing and advertising but wasn’t creating a way to track offers or to find out how people were hearing about her store. Amy admits that like many businesses she was “totally guessing” what was and wasn’t working in her marketing. After coaching, measurement became more of a strength than a weakness for Amy. She started reviewing how many people walked through her doors and how many were local vs. tourists. This became valuable information that she was able to share with the City’s Greenhouse Manager as a data reference that they were grateful to use for current and future retail stores locally. She began measuring her response rate on marketing dollars invested. Amy shared that “having a measurable result was an aha-moment for me because it was very clear if I got a return on investment in that particular ad, coupon, etc.” She was able to analyze the data and make decisions on where to scale back on time and cash that she was putting into strategies that weren’t working – and put more time and money towards what was working. Overall her approach became “more analytical instead of just a shot in the dark method”. Her attention to the financials also resulted in creating projected revenue goals and discussing in real time how close they were to goals with the team. She was also able to start paying herself and excitedly shared that she was able to have “a steady salary after I started working with [my coach] and was officially on payroll”. Amy talked about how helpful the recruitment process was that her coach gave her and helped her to implement. She said that before coaching she “was apprehensive about hiring a stranger – it seemed really scary to me so I was not hiring anyone when I really need to”. With the help of coaching, Amy was able to put a hiring structure into place that she used again and again when staff didn’t work out or moved away. Amy shared her experience with the hiring process as“really intimidating at first especially the group interview, but it turned out to be so great and definitely helped me to narrow down who to bring in for the next step”. With the help of coaching, I was also able to hire a staff of three part-time employees so I could use my time for production and money-making activities as well as having weekends off to spend time with my husband. The other realization Amy had after coaching was that she didn’t need to settle on sub-par staff and that “if they weren’t in it to win it with [the team], then it was hurting [the] business”. She was much more confident with the realization “that [she] was better off letting them go and being without an employee for a while, than having somebody on the team who was bringing us down”. Amy mentioned that the sales training her coach provided for her and her team was really great because it “opened the employee’s eyes to a sales approach that gave them a feeling of confidence in their role as a sales person rather than feeling like pushy sales people”. Amy made a point to mention that understanding her own communication style and what motivated her decision making was “really eye opening” for her. She valued her coach “continuously pointing it out” to her so that she could “stop it before I would feel anxiety about having hurt someone’s feelings and re-frame the situation”. She said that “re-framing was a really big thing” for her and that she will “take that with [her] moving forward in both my personal and business life”. What is it like being coached? Amy described having a business coach as someone “who you can bounce ideas off and who also brings ideas to the table you haven’t thought of before which starts to create more opportunities”. She goes on to share a recent example of when she decided to close the store. She wasn’t going to have a going away event until her coach encouraged her to do it. Not only did they have an event but they also handed out a coupon to retain customers for her online shop which will remain open. The bon voyage event day was a huge success and as Amy described it was “by far the biggest sales day by double of previous sales records – it was bananas successful”. Amy would describe business coaching to another business owner as “someone that pushes you out of your comfort zone and helps you get to the next level. Whether you are a beginner or someone who is more advanced, there are things you will take away”. She plainly states that “it’s a cheesy phrase, but tools in your toolbox. You guys gave me so many tools to use that I didn’t have before”. Amy talked about the value of having follow up “homework” which forced her to do things she might not have done on her own but were really good for her business. She found it motivating to have a guide when implementing new processes and tackling challenges. She shared that she “didn’t really realize the level of achievements” she was having until “someone else pointed it out” to her. To those considering coaching and the investment…. Amy would “recommend a business coach – especially if you are at a point where you are having growing pains and you are not sure how to get to the next level”. She found it as a “good place to have someone guide you” and “yeah the financial obligation was intimidating for sure, but I kind of look at it as an investment in myself and my business”. She goes on to clarify that “these are lessons that I am going to take with me into the rest of my life, for however long I have a business, I have these skills that I will always have now”. Amy ended by saying she really valued and appreciated her coach, Juliet Kyes, for her positive perspective on life and her ability to turn a problem into an opportunity. Amy said that she now has Juliet’s “voice in my head whenever I start to have anxiety, now I think to myself this is a learning opportunity, a growth opportunity, or a whatever opportunity” and she no longer “dwells on anything stress inducing and now looks at bad things as something that can be turned into a positive”. Strands of Sunshine opened in the fall of 2012 in downtown St. Petersburg, FL, in the heart of the city’s Central Arts District. Owner and artist, Amy Marshall, created ‘Handcrafted Goods for Happy People’ at her work bench right inside the shop. Amy is currently traveling and running her online shop featuring handmade, one-of-a-kind jewelry. Before leaving for her adventure in Europe, the St. Petersburg City Council recognized Amy as an official Sunshine Ambassador for outstanding goodwill and valuable contributions to the City of St. Petersburg, FL. Follow her journey on Facebook! Average vs. Extraordinary CEO: Which One are You?